The Senior Leadership Group is a completely unique offering in the marketplace and a means to groom and develop future leadership. This group provides executives the opportunity to interact with some of the brightest and best up-and-coming business leaders within our community. It is designed for those who want to grow their skills, challenge their thinking and broaden their experience in an arena where confidentiality and trust are assured. Over 90% of the group’s members have been hand picked and nominated by their C-Level Executive or President. This is an excellent opportunity for Business Leaders to groom their Executive Team and to facilitate the succession process. Understand how to be a participant of, and how to create, a High-Performance Team (HPT). Why? HPT’s will directly influence revenue growth and can support the creation of an inclusive organization culture that contributes to better employee engagement. What? Unbundle the key attributes of high performance teams from several industries and compare to your team. How? Application of various best practices learned from the PEO Peer Advisory process will be employed including: roundtables, presentations, guest speakers and facilitated access to other high potential Canadian leaders. Deepen and expand one’s knowledge of the breadth of business. Why? Success today, and into the future, requires functional leaders to be able to effectively step outside of their functional expertise and deliver results that integrate and align with the company direction. What? Leaders develop the ability to: challenge and solve complex problems; navigate and process large amounts of information; and lead with keen awareness from both their function and organizational perspective. How? Access to other High Potential leaders to explore real-time situations around budgeting, market positioning, acquiring market knowledge, strategy, structure and operations in a confidential arena. Learn with other successful leaders about their industries, better understand risk and key influences on the critical decisions that are imperative for the organization to move forward and succeed in a timely manner. Ultimately broaden their thinking and prepare them to advance into more senior roles within the organization. 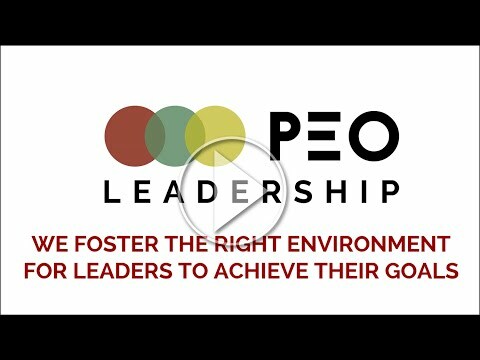 Personal development through the application of PEO proprietary tools. Why? As Socrates said, the quality of a person’s life will always be in direct proportion to the quality of the questions they are willing to ask themselves. What? Improve the member’s self-awareness to accelerate the accomplishment of their goals. How? Through an explorative type enquiry, to enable the member to think more effectively into their existing results and their root cause, in order to improve how they think into their intended results for their career, business and personal life.